I can’t believe I haven’t posted this recipe up yet!!! Thank goodness I had a picture of it, because my caloric intake for the day would be through the roof with this addition to the menu today. No kidding, hands down, one of my new favorite “messy” snacks/desserts. One of the best oh-so-gooey, sticky, crunchy, buttery, lick-your-fingers, amazing, edible creations. You must try this if you are a fan of Nutella! Extremely recommended. Man, now I’m craving this fantastic, drool-inducing item….dang calorie counting…. This came from my favorite television Chef, Sunny Anderson. 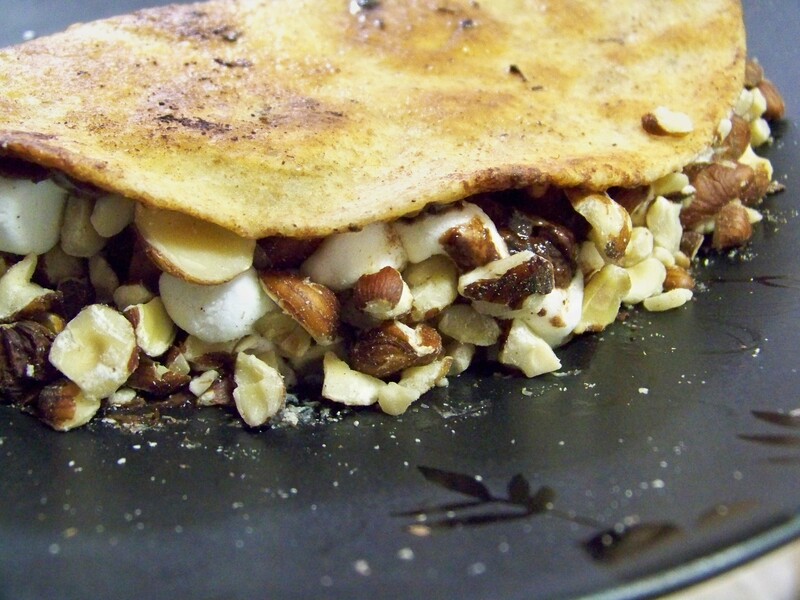 She calls it “Sunny’s Fake Crepes”…I call it “Divine Invention”. Once you get this recipe down, it is really one of the quickest and easiest treats. Add 2 of the tortillas with the chocolate hazelnut spread side facing up. Using an imaginary line add 1/3 cup of marshmallows down 1 half of each tortilla, making sure to keep them in a single layer. Allow the tortilla to slightly bubble on the pan and check underneath for a golden, toasted color. Fold the tortilla over to form a half circle and slightly press down to seal. Cook until marshmallows start to melt but don’t lose their shape. Transfer them to a cutting board. Meanwhile, put the chopped hazelnuts on a plate. Cut the tortillas in half, then quickly press the opened sides into the chopped hazelnuts. Serve immediately (for best gooey results). Yes, yes, yes. That’s delicious looking; Nutella is one of those little secrets that people don’t know about. Oh I love it! How do you enjoy it? I kind of love that you posted about Nutella twice in the space of a week. Wow these treats look totally amazing. Great work. Connect with me at wishjoy.wordpress.com. Cheers! Thanks! I will check you out!